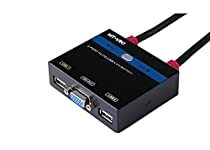 The switch is a 2-port USB Cable KVM Switch that provides a simple and quick method of selecting computers - a built-in remote port selector. This allows the CS22U unit to be hidden from sight, while the remote port selector can be placed conveniently on the desktop. It can control 2 pcs in console-end by a set of usb keyboard, mouse, vga display, automatic scan and monitor each computer in the work or vga equipment. It support stereo independent audio output and switch.